She's also available as a blank greeting card and as a very sweet magnet. I want everyone to be able to enjoy their very own Tina at home! a member of the Ruston Highland Cows. I just adore her attitude. I always say that cows have such a curious, inquisitive nature which makes for brilliant paintings. However you also get the super models of the cow world. When the camera is flashing they strike their pose, much like star of the Lauren’s Cows herd Wallace. On this trip Tina was the Cat Walk Model of the herd. This painting is really striking and is like a window out into the countryside. 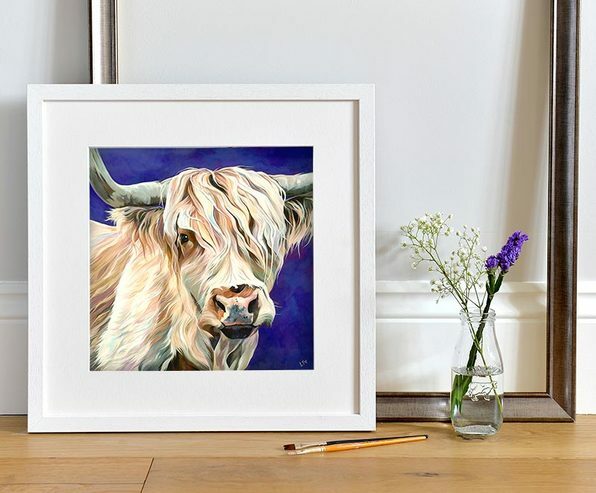 It shows the statuesque beauty of Highland cattle, and has a really calming effect. 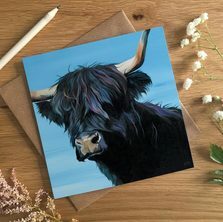 Plus having a black coat she’s a nice twist on your usual Highland Cow painting. 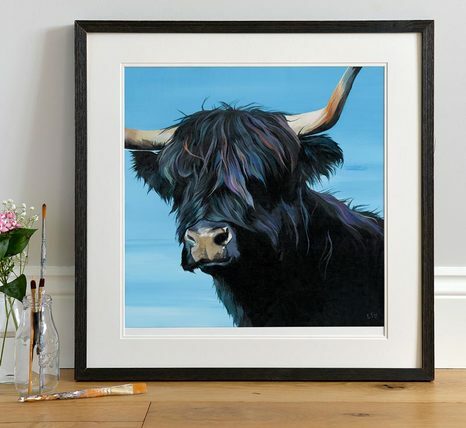 Next is probably one of my favourite paintings in the Lauren’s Cows herd. Lizzie, was originally designed as a Christmas Card. 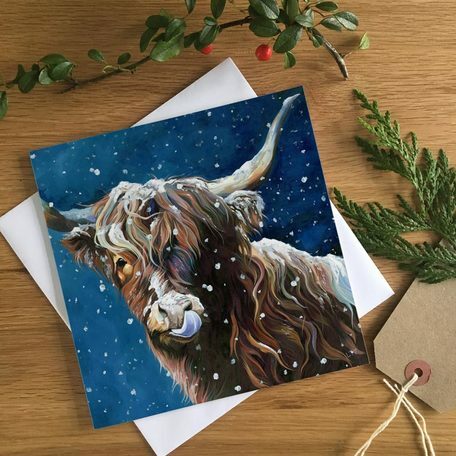 The plan was to paint a beautiful Red Highland in the falling snow. 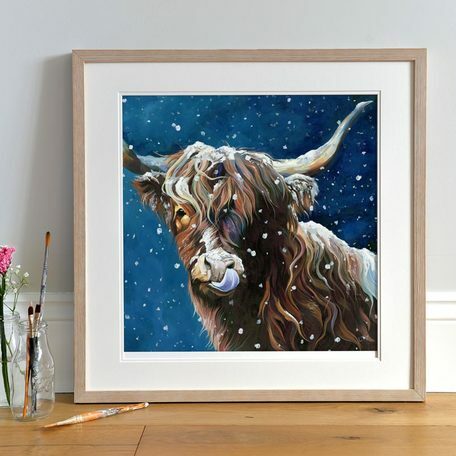 Well I painted the Cow first… and then couldn't’t bear to put the snow! I just fell in love with the whole feel of this painting, the light and shade the luxurious blue background that I had to make it available to have in the home. 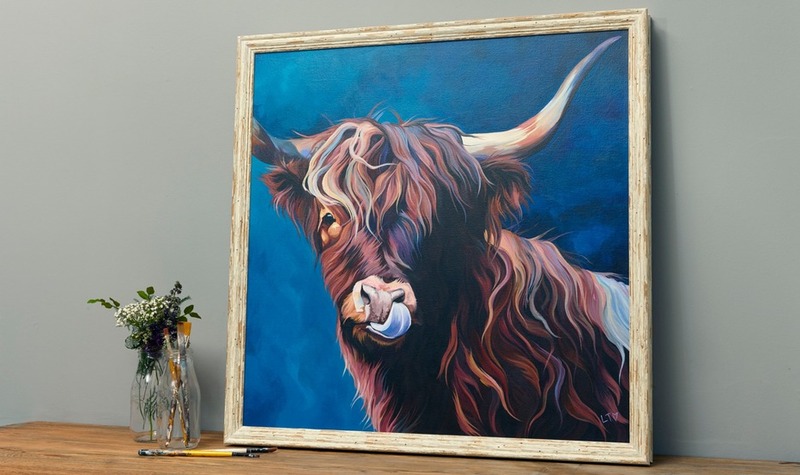 This print has a wonderful balance of character and class, and I think it would make an incredible statement in any home whether the home owner is a cow fanatic or no. Of course, I couldn't just forget about my fantasy snowy scene so, due to the wonders of modern technology the snowy Christmas Design ‘Snowflake’ is also available and insanely adorable! You could buy both versions and swap Snowflake for Lizzie to match the seasons! And finalising our Highland fling our luscious blonde Ronnie. Years ago I painted an oil painting with a dark purple background and it’s something I’ve wanted to try again for a while now, I was just waiting for the right subject. This rich violet background brings out the blonde tones in Ronnie wonderfully. This painting would look fantastic in a home with neutral decor. The subtle colour palette of this painting would compliment taupe and cream surroundings, while the rich background lifts it from the wall. And can you just imagine Ronnie paired with Lizzie? All of the new members of the herd are available online as Open Edition prints. 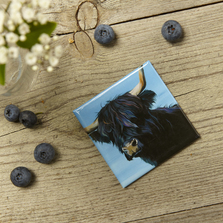 But I have even bigger plans for these Highland Cows. So watch this space.